The global economy faces a period of uncertainty, with risks to continued growth much higher than they were six months ago, the head of the International Monetary Fund said Monday. Spain's Rodrigo de Rato said recent turbulence in credit markets, the worst in a decade, is a warning that the continually expanding global economy of recent years cannot be taken for granted. As a result of the turbulence, he said the IMF expects "a slowdown in growth but not a recession in the United States, and a smaller slowdown in other advanced economies." 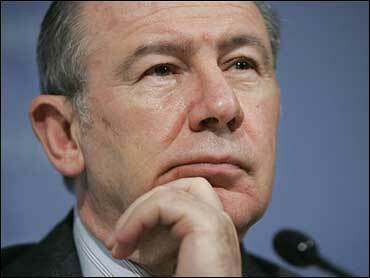 De Rato spoke at the closing meetings of the IMF and its sister institution, the World Bank. It was his last address to the group; he is stepping down as the head of the 185-nation lending organization after 3½ years. His successor, France's Dominique Strauss-Kahn, takes over Nov. 1. Groups demonstrating against global warming and war snarled traffic Monday around Capitol Hill, leading to dozens of arrests. Monday's demonstrations, which involved several hundred people, were part of a "No Warming, No War" protest that combined an environmental agenda with an anti-war stand. The crowd included several people wearing polar bear suits and carrying a sign that read "Polar bears for solutions to war and global warming." "And there is a risk that exchange rate appreciation in countries with flexible exchange rates - including the euro area - could hurt their prospects, and that, in these circumstances, protectionist pressures could worsen." He likened the turmoil in credit markets to an earthquake. "Like most earthquakes, it has been something distant for most people, something they read about in the newspapers," he said. "But there is still a risk of aftershocks, and the full effects of the disruption we have already had will only be felt over time." He told his audience of finance ministers and central bankers that, along with the IMF, they need to consider what actions to take to limit the damage and what lessons can be learned from the crisis. The Group of 24 developing countries noted wryly in their communique that, for once, a financial crises began in one of the advanced nations instead of in Asia or Latin America, as has happened in the past.